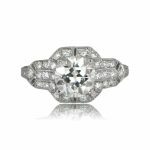 Edwardian or Art Deco – Which Engagement Ring Is Which? 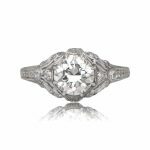 Both Edwardian engagement rings and Art Deco engagement rings are stunning pieces, rich with detail, character and history. Understanding the differences between rings of these two distinct periods can help you better appreciate their beauty and choose the ring that best symbolizes both your personal flair and the timeless love of your relationship. The Edwardian era, named for the English monarch Edward VII, is the period stretching from the end of the nineteenth century and into the beginning of the twentieth century, roughly from 1890-1915. This was a time of superb craftsmanship, as jewelers began working more extensively with platinum, favored for its hardness as well as its bright sheen. Flowing, graceful lines are a key element of the Edwardian jewelry style, including bows, florals, ribbons, garlands, loops and other curved motifs. Fine millegrain borders were popular accents, as were pierced patterns that turned platinum into lustrous lace. 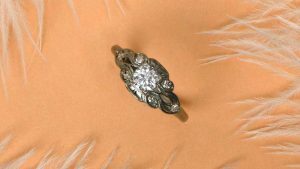 Large center stones could be diamonds, though colored stones that paired well with platinum were also popular in Edwardian engagement rings, and round, oval and marquis diamond shapes were the most desirable. Edwardian-era rings tend to be larger, opulent pieces, and stacked ring designs were popular. The metal surfaces of the rings were often diamond-encrusted for additional shimmer. Each of these rings is a work of art, showcasing a bygone era of grace, elegance and the royalty the Edwardian era is named for. Click here to view our rare collection of Edwardian Rings. Art Deco jewelry is somewhat newer than Edwardian pieces, as the Art Deco period – named for the Exposition International des Arts Décoratifs et Industriels Modernes, the World’s Fair that took place in Paris in 1925 – stretches from roughly 1920 to 1939. Unlike the previous era of softer lines and grace, the Art Deco period is characterized by bold geometry, sharp angles and strong patterns. 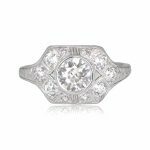 Art Deco engagement rings often show fierce patterns such as fans, grids, octagons and chevrons, often with a futuristic or very modern tone. 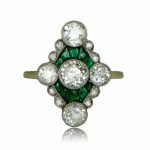 Diamonds in Art Deco rings and jewelry are cut more brilliantly than their predecessors, and emerald cuts are a popular choice. Colored gems, especially sapphires, onyx, emeralds and rubies, are popular, not just as center stones but also as accents to highlight the design’s geometry. Pierced, cutout patterns are still as popular as they were with Edwardian rings, but the lines are sharper and angles more severe. 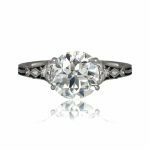 In this era, platinum remained a popular choice for engagement rings, but white gold also become more widespread as it was far more affordable during decades of economic hardship. Click here to view our rare collection of Art Deco Rings. 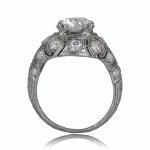 Because Edwardian engagement rings and Art Deco engagement rings are so similar in many ways, it can be challenge to tell them apart. In particular, late-period Edwardian pieces and earlier Art Deco pieces can share many characteristics of those transitional years. Metal Use – While both ring styles frequently use platinum, if the ring is white gold, it is more likely to be from the Art Deco period. This is especially true of rings later in the Art Deco period, in the late 1920s and 1930s. 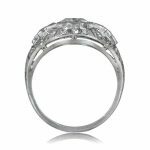 Symmetry and Repetition – Edwardian rings are less likely to be geometrically symmetrical, while Art Deco styles have very obvious and calculated symmetry. This symmetry carries in repeating patterns through the entire ring, including side stones and into the band. 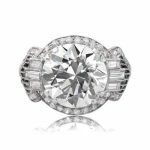 Curves or Angles – Rings with more graceful, flowing curves are more likely to be Edwardian pieces with flowing lines that mimic ribbons or bows. 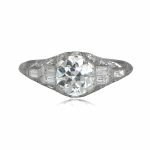 Art Deco rings have sharper angles and many straight lines, showcasing more modern architecture and style. Stone Choice – Diamond center stones are popular in both eras, but accent stones can be great clues for separating Edwardian and Art Deco styles. 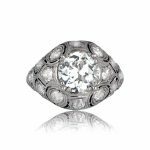 If a ring is paved with many small diamonds, it is more likely to be Edwardian, while a ring using colored gems to highlight a pattern is more likely an Art Deco style. Because these jewelry eras can be so similar, there are transitional periods between them that can make it very difficult to separate the styles. If you are having difficulty deciding which style better suits you or which rings you like best, our experts would be happy to consult with you and offer different options to find the engagement ring of your dreams – no matter which era it belongs to.